If you want it to be customized , please send us your follwing measurements by e-mails . 1.Full Bust = _____ cm. 4.Shoulder to Shoulder = _____ cm. 5.Shoulder to floor Height (from shoulder to Ground) = _____ cm. 6.Height -(from the top head to the floor) = _____ cm.___ cm. Mermaid Style ;Backless ;Long Sleeve.Appliques Lace. This dress is handmade , We need about 4-7 working days to make it . Expedited shipping :3-5 working days .Can be arrived within 2 weeks with expedited delivery. 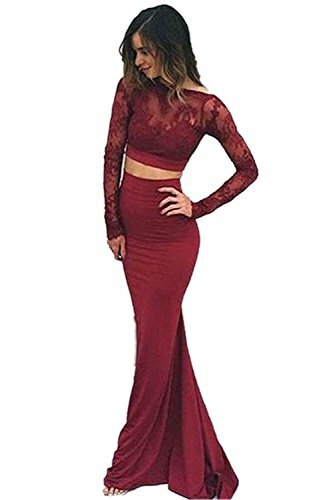 It is great for prom, formal evening party, celebrity party, bridesmaid, homecoming, banquet, military ball, evening, wedding party and other special occasion. Customized sizes and colors are also available. Please send us your detail size: Bust, Waist, Hips and Hollow to Floor. (See Product Description list) , we are always at your service.